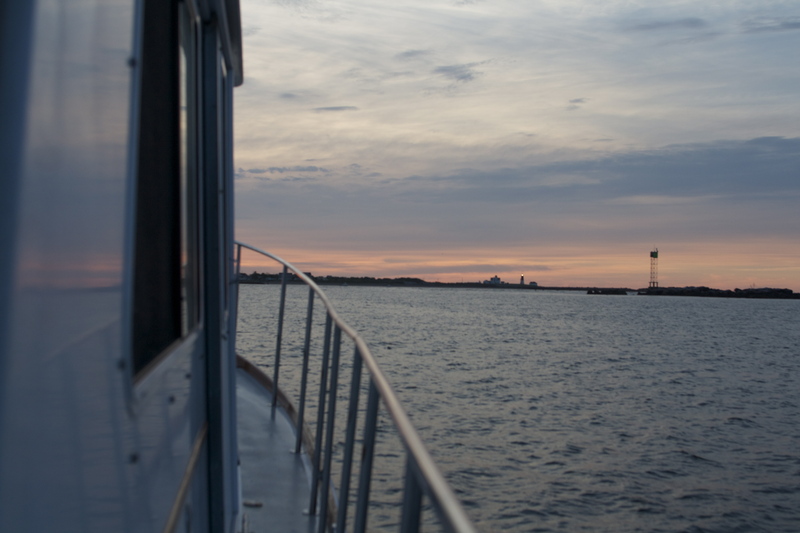 0515: We raise the anchor and pull out of Point Judith’s Harbor of Refuge and into the Sound. 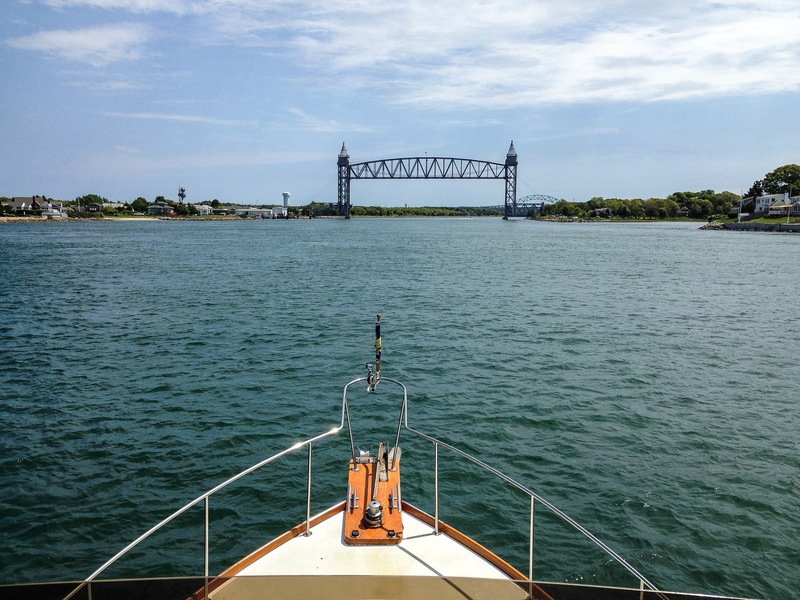 The promise of 30 knots of wind in the afternoon inspired us to start early and get through the Cape Cod Canal as quickly as possible. 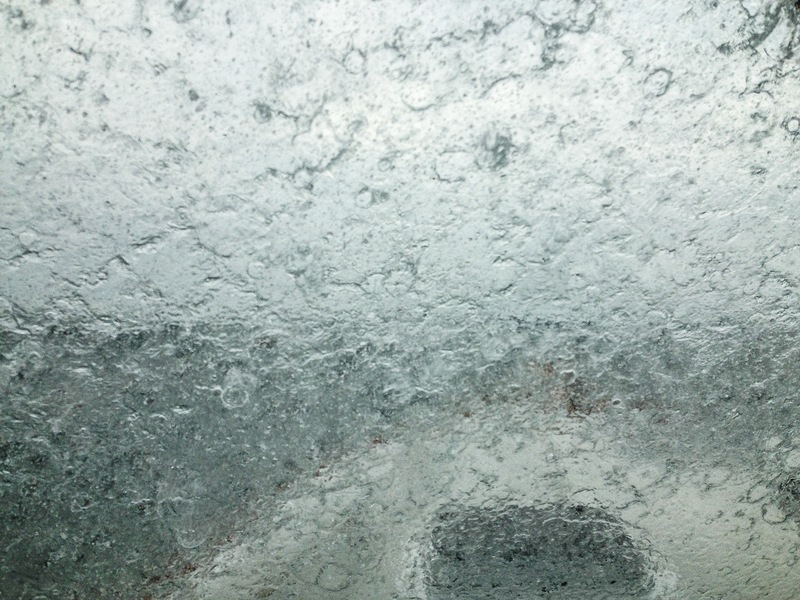 Once through the canal, the strong wind and waves would be on our stern. That was the plan. Two- to 3-foot chop on the beam was a rude wakeup call. The weather wasn’t the only thing not cooperating with us; we had electronic difficulty as well. For some reason—unknown at the moment—our Raymarine electronic compass failed, causing us to lose heading info. The result of this was that our chart plotters showed the boat facing south while we were running east. The good news is that Gizmo has multiple redundancies of every system and our Simrad plotter (running off a separate electronic compass) was picking up our heading just fine. There is a lesson here: Even on a floating laboratory like Gizmo, things happen and backups need to be ready to be called into the game. Like the eye of a storm, the Cape Cod Canal was a calm and peaceful middle of our day. Navigating from the flying bridge, I sat with the warm sun on my face as bridges, fishermen, and other boats passed by. Intent on making lunch, Ben stepped away from the bridge and suggested that I plot the next leg of our course from the canal mouth to Scituate, Massachusetts. “I didn’t plot that part yet, but it’s super simple,” said Ellison. “Plot the course, OK, got it,” I responded, as the fleet of MFDs stared up at me. I started with the Furuno at the far left, quickly grew discouraged and moved on to the Raymarine display. I got closer that time but couldn’t immediately locate Scituate. This game continued until I got to the Garmin MFD to the far right. Garmin was what I use on my boat. “Come on ol’ buddy, don’t let me down now,” I whispered, hoping that it would help. It didn’t. This brings me to lesson number two of the day: The best marine electronics money can buy are only as helpful as your working knowledge of each unit. After a few minutes I did get the Garmin course set and shortly after, sucessfully set a course on the Furuno display. I plan on practicing with the other MFDs on the helm tomorrow when conditions are better. After leaving the canal, we were met by steep following seas and wind gusts to 34 knots that had us surfing and swerving our way up the Massachusetts coast. After a few hours of rocking and rolling Ben made the (smart) decision to grab a mooring at the Plymouth Yacht Club in Plymouth, Massachusetts, for the night. The timing was right; after we got settled in the protected harbor we witnessed wind gusts north of 40 knots. A short walk from the marina took us past the fabled Plymouth Rock (the alleged location where the pilgrims first landed in the America). Tourist-filled buses filed out to see the overhyped stone. We quickly made our way passed the selfie-snapping tourists in search of dinner and a cold drink. We found both at a waterfront eatery called Cabby Shack. Plymouth is a nice town to walk around and explore, which is good, because strong winds will likely keep us here for another day. 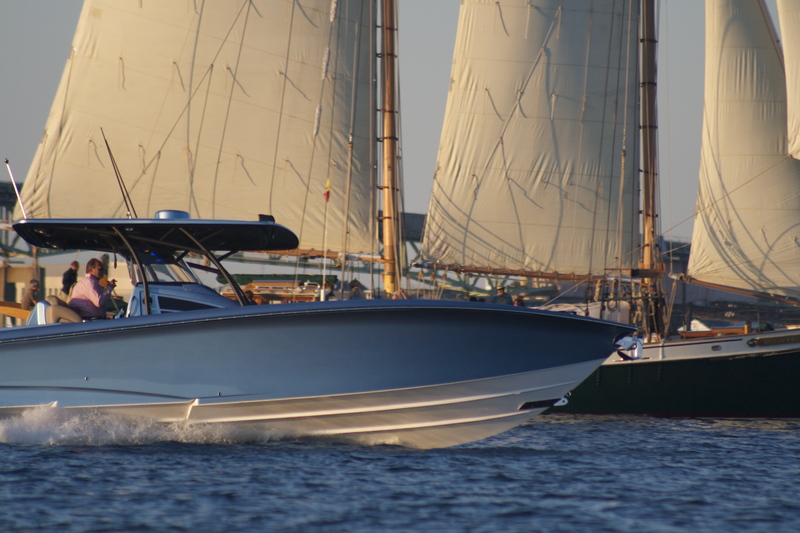 A wooden-hull schooner shares the channel with a sleek and modern center console, proving that on the water, we can all get along.